Studying the work of fine artists through the centuries can tell us a lot about the times and lifestyles of their subjects. This is especially true when it comes to portraiture. The painting styles of these artists also inform us about the current artistic trends of the day. Please take time to enjoy the 12 portraits that drew my interest inside of our Museum of Fine Arts, Houston. 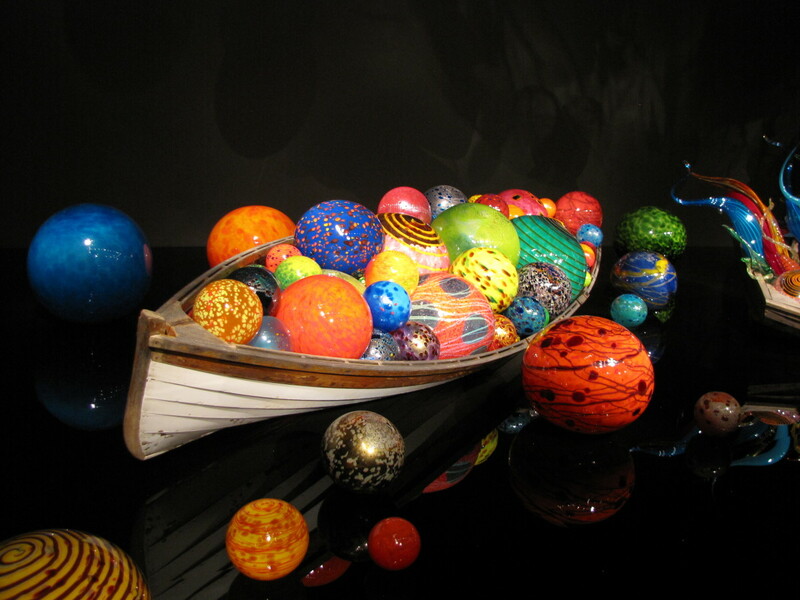 This is a small sample of what you will find if and when you get to visit our fine arts museum in person. There are areas where photography is allowed as long as one does not use a flash and other areas that are off limits. Obviously, the portraits offered here for your viewing pleasure are from the area where one can take pictures. Please enjoy! This is a Russian artist who lived from 1864 to 1941 and who created this Portrait of a Woman in 1912. It is an oil painted on board. The notes to the side of this striking painting tell us that Jawlensky liked using the "strong colors of Fauvism" and also the "vigorous brushwork of Expressionism." 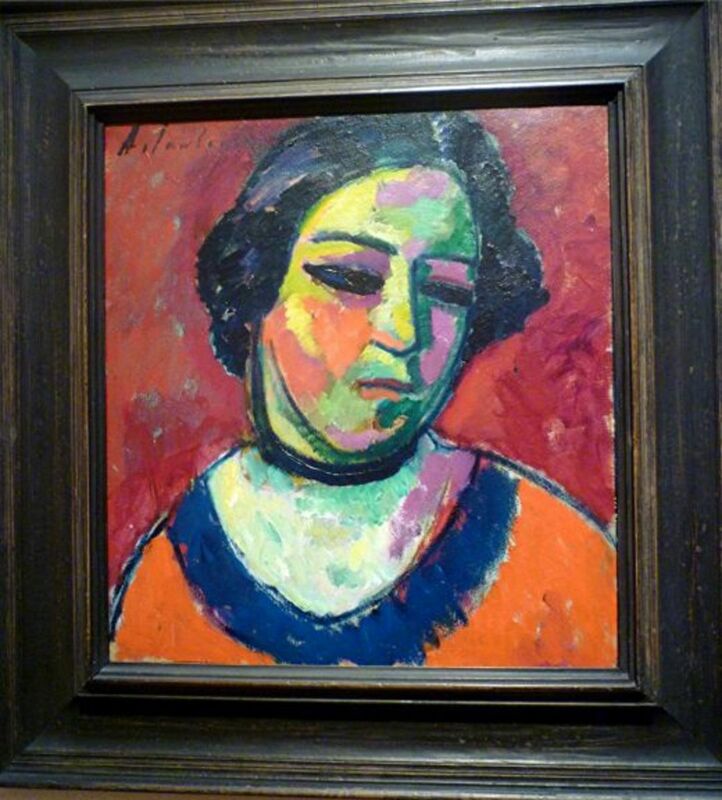 In a book of his memoirs, Jawlensky thought that the series of square pictures of large-scale heads like this painting were considered by him to be the best work that he had created. This most famous of painters was French and lived in the years from 1839 to 1906. He was a post-impressionist painter bridging the 19th and 20th century. Both Matisse and Picasso who both became famous painters credited Paul Cézanne with being "the father of us all." Although his father wanted him to study law, he ultimately financed his study of art. Due to that generous allowance, Paul Cézanne was not the typical "starving artist" but was free to learn and explore. 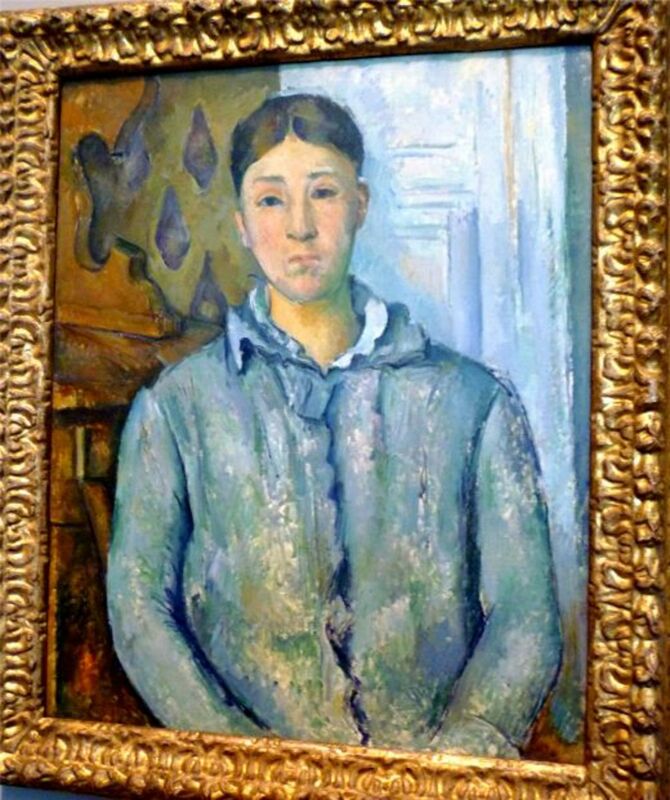 In this painting above, titled Madame Cézanne in Blue, he portrays his wife with his distinctive brushstrokes and unique choice of colors. This oil on canvas titled Empress Eugénie was created in 1854 by Franz X. Winterhalter, a German artist who lived from 1805 to 1873. According to the notations to the side of this portrait painting, Countess Eugénie de Montijo was of Portuguese descent. After marrying Napoleon the third in 1853, she graced the French throne with grace and elegance emulating the fashionable Marie Antoinette. 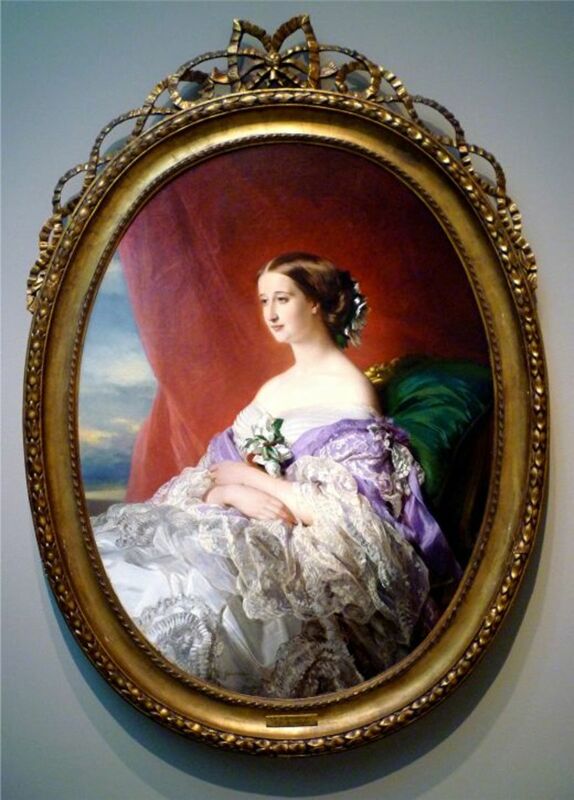 With the patronage of Empress Eugénie and the French court, Franz Winterhalter's fame and success as a portraitist became well known. The Empress was a beautiful woman and was gracefully adorned with layers of elegant clothing for this particular portrait. The youthful lines of her neck and shoulders were accentuated by the simple flowers placed at her bosom. Her upswept hair and her youth were forever captured and memorialized with this particular painting. An English artist who lived from 1769 to 1830, Thomas Lawrence produced this Portrait of John Joseph Henry as an oil on canvas in the year 1805. Thomas Lawrence was the leading portrait painter in England at the time. John Joseph Henry (when he sat for this portrait) was the high sheriff of County Kildare in Ireland. 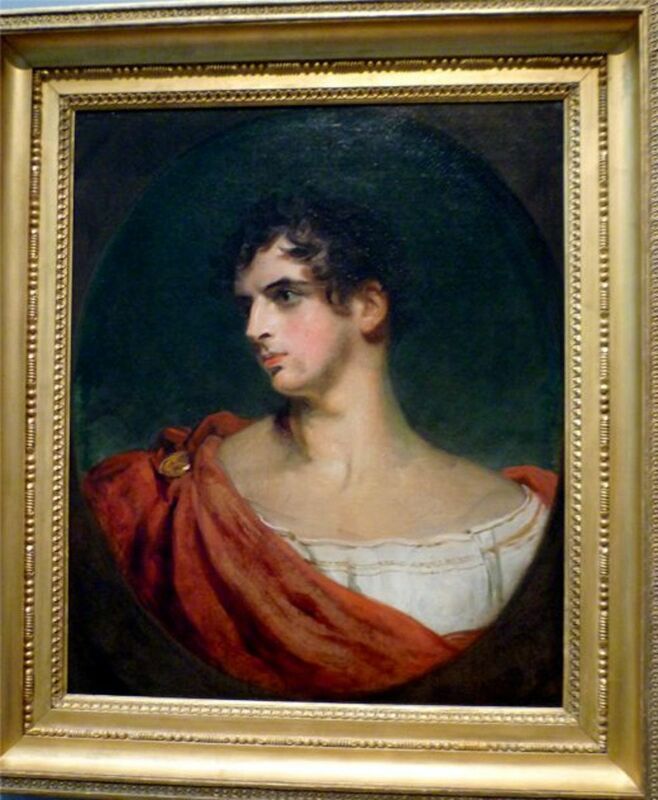 He is dressed in Roman costume with his hair cut in a "Brutus crop" which according to notations at the side of this painting was popular at the beginning of the 19th century. Lawrence died before finishing and delivering this painting to sheriff Henry. It is painted over a sketch of another male sitter which is still slightly visible under the right kind of lighting and with some scrutiny on the part of the viewer at the bottom of this canvas. This was a French artist who lived from 1869 to 1952. 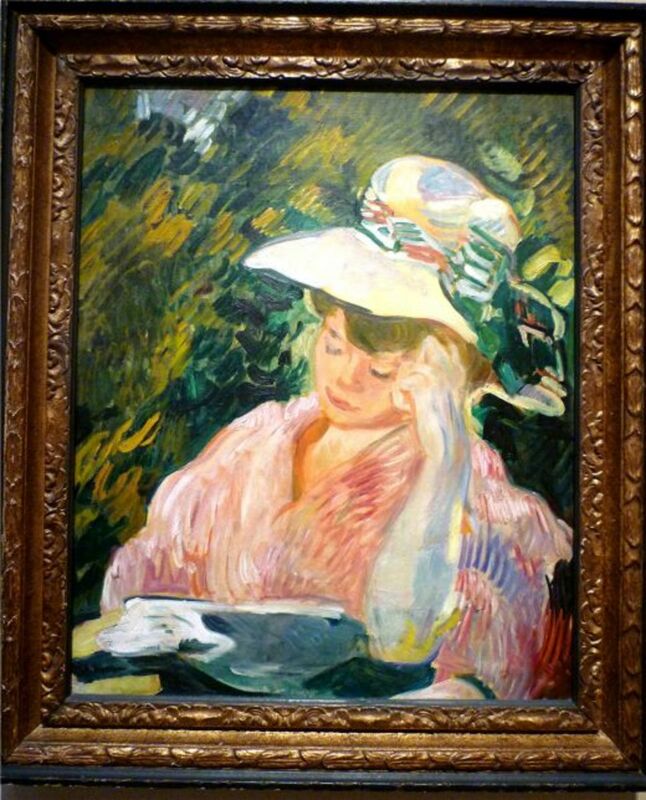 In 1906 he painted this charming oil on canvas using his wife, Madame Valtat, as his model. Louis Valtat was among the first painters to embrace the colorful style of fauvism blending it with an impressionistic style. He was a participant in the very first Fauve exhibition at the Salon d' Automne in 1905. Can you see evidence in this painting of his being influenced by the artists van Gogh and Renoir? This Italian artist lived from 1884 to 1920. He created this oil on canvas titled Léopold Zborowski in 1916. Léopold Zborowski was a Polish poet who met Modigliani in the Parisian neighborhood of Montparnasse. 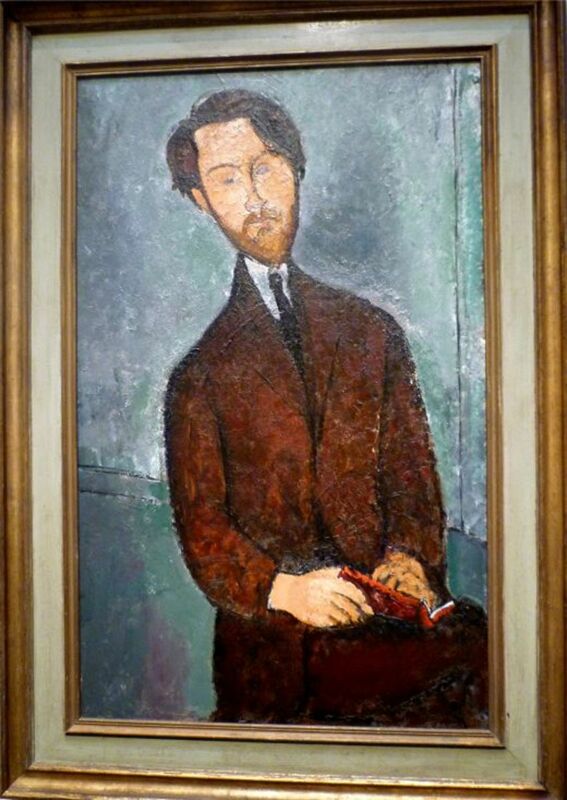 What is really interesting according to the notations to the side of this painting is that although Léopold Zborowski was not a rich man, he so appreciated the work done by Modigliani that he decided to financially support him. When he died, Zborowski's widow had to sell all of the Modigliani paintings in her possession because of being left so deeply in debt. That is not your typical story of art patronage! This was a French artist who lived from 1868 to 1940. He painted this distemper on canvas from 1913–1914. 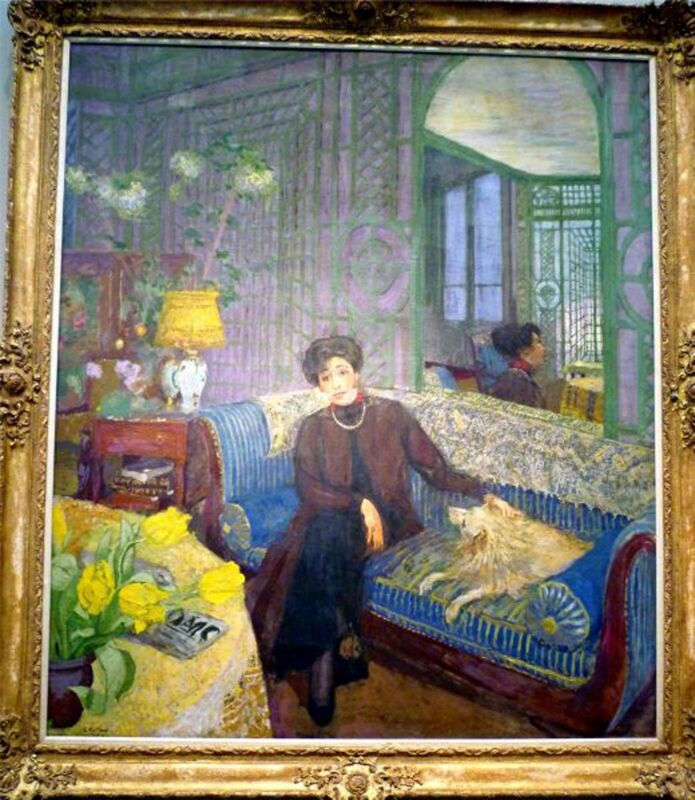 The subject matter is titled Marcelle Aron (Madame Tristan Bernard). This stylish lady is forever captured on canvas petting her blonde dog in this highly patterned room in which more of the surrounding space is reflected in the mirror behind her. The following from Wikipedia describes distemper painting: "Distemper is a decorative paint and a historical medium for painting pictures, and contrasted with tempera. The binder may be glues of vegetable or animal origin (excluding egg). Soft distemper is not abrasion resistant and may include binders such as chalk, ground pigments, and animal glue. Hard distemper is stronger and wear-resistant and can include casein or linseed oil as binders." This artist was French and lived in the years 1656 to 1746. He painted this Portrait of Pierre Câdeau de Mongazon in the year 1715. It is an oil on canvas. According to notations to the side of this painting, Nicolas de Largilliere was an extremely prolific artist in his time, producing well over 1,500 portraits! This subject "was probably painted about 1715 just after the sitter had been appointed as a court magistrate." Look at that terrific curly white wig on the magistrate's head. At least I am supposing it is a wig which seems to have been part of the costuming just as important as the robes worn in court back in that time. An English artist who lived from 1723 to 1792, this oil on canvas of the Portrait of Mrs. Jeff Powis and her Daughter was painted in 1777. First president of the Royal Academy in London, Joshua Reynolds was the most influential artist and one of the most important portrait painters in 18th-century England. In his lectures to the Academy, he urged that modern painting, even portraiture, be based on antique prototypes. He seems to have followed his own precept in this portrait: the painter "dresses his figure something with the general air of the antique for the sake of dignity, and preserves something of the modern for the sake of Likeness. This is a French artist who lived in the years 1685 to 1766. 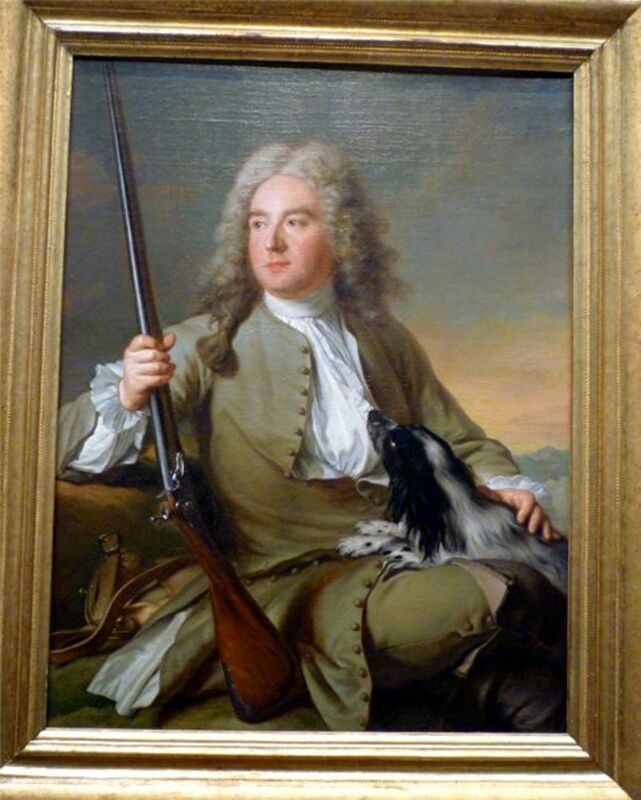 He executed this oil on canvas in 1727 and the subject is the Portrait of Monsieur d' Hôtel in Hunting Clothes. Back in the 16th century, the aristocracy often chose to be portrayed with some of what would have occupied a portion of their time. In this case, the hunting gear and one of his dogs obviously was a favorite pastime of his. We can learn much about the leisure interests of the wealthy by looking at portraits such as this one. Jean-Marc Nattier started out as a history painter but turned to portraiture because it more readily paid the bills. Henry Raeburn was a Scottish artist who lived in the years from 1756 to 1823. He painted this Portrait of Lieutenant Colonel William Shirriff, H.E.I.C.S. in 1800. It is an oil on canvas. This proud looking Lieutenant Colonel was in the service of the East India Company in 1800 and died in 1802 as the result of an accident. 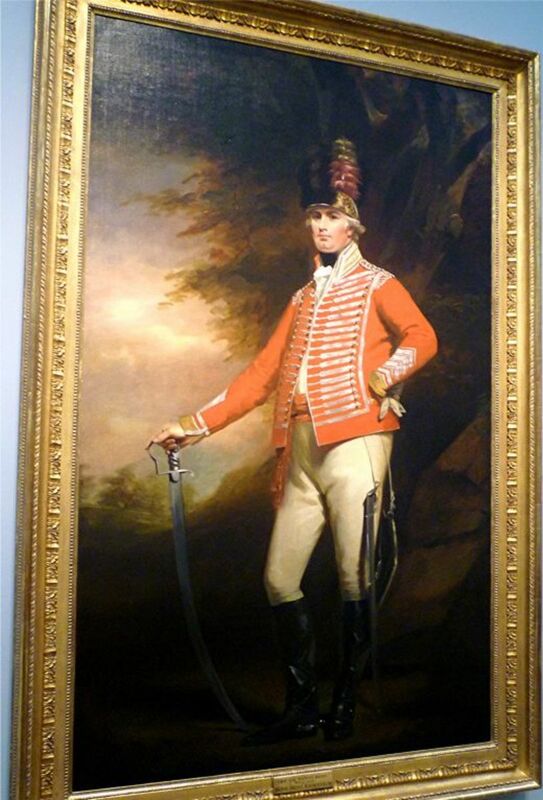 It is a large canvas and shows the proud looking Lieutenant Colonel in his elaborate costume wielding his sword. Henry Raeburn made his successful career painting entirely in Scotland rather than migrating to London as so many other artists did in that day and time. A French artist who lived from 1645 to 1730, Francois de Troy painted this self-portrait in 1704. This self-portrait along with one of his wife was exhibited in The Academy Salon of 1704. 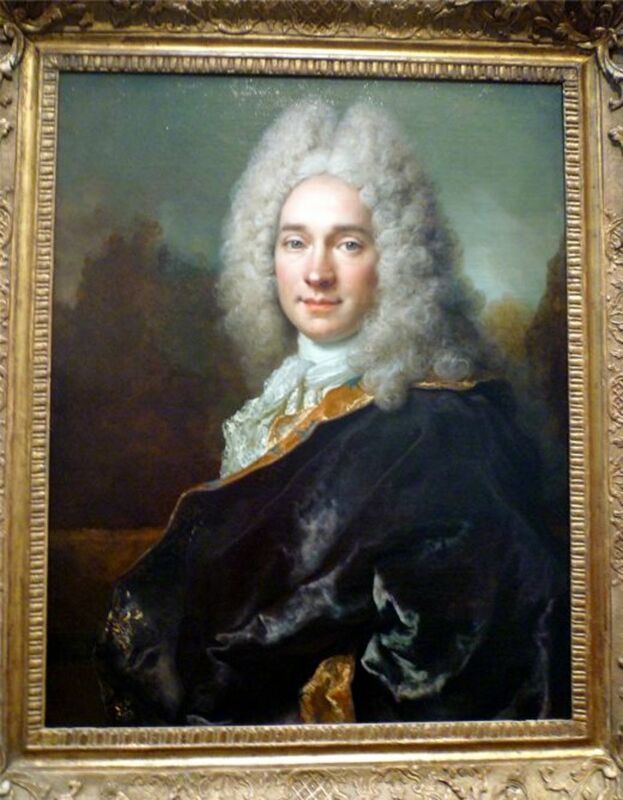 Francois de Troy painted for many monarchs including Louis XIV and Louis XV along with other members of high society. He was famous throughout Europe and almost exclusively painted portraits. His son Jean Francois de Troy followed in his footsteps and also made a name for himself as an artist. 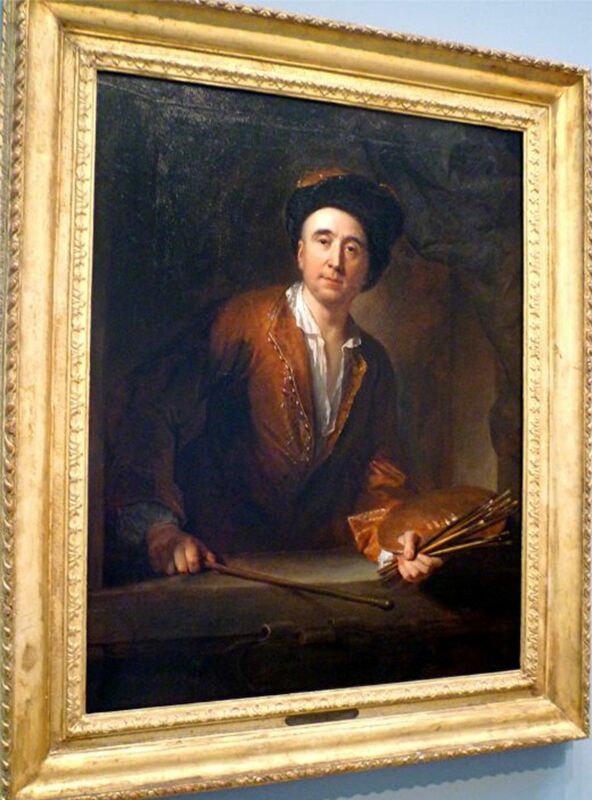 Without even knowing who he was it would be easy to identify this man as an artist and painter with him displaying his palette and brushes in this pose. Hopefully you enjoyed this look at 12 of the portrait paintings found inside of the Museum of Fine Arts, Houston. It is a fantastic museum holding these masterpieces and so much more. 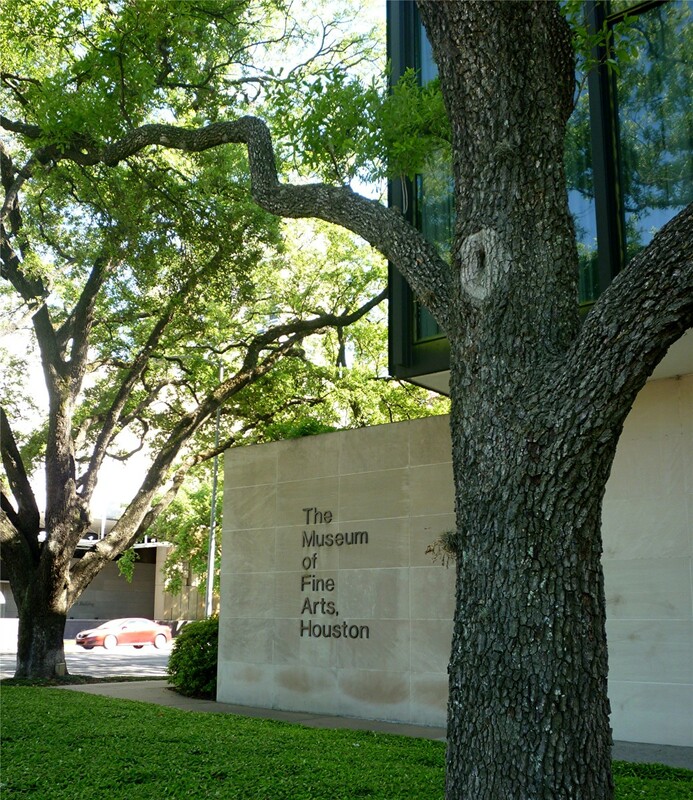 If you get a chance to visit Houston, Texas be sure to set aside some time to visit our fine arts museum. It will be time well spent! Which of these portraits did you find to be the most beautiful and/or interesting? You probably come from a very handsome family and are too modest to say so. Ha! One's choice in art is always personal and everyone's taste is different which makes life interesting. Peggy they were not. Which was fortunate because we aint a pretty family ;) Each family member seemed to have their own tastes. My grandmother had a very nice (and BIG) painting of d'Artagnan and one of a old soldier. The soldier's portrait must be famous because I see it hanging in the home of Neville (Charlton Heston) in the 1971 classic film The Omega Man. It is wonderful to grow up with lovely art in one's home. Were the portraits of any of your relatives? I was fortunate enough to grow up in a home that had several beautiful paintings of portraits and I was mesmerized by them. You have shown us some very nice examples here too, thank you. The portraits shown here are but a small sampling of what you would find if you would visit our Museum of Fine Arts in Houston. Glad you liked viewing these. I also appreciate the Cezanne. Who knew that your museum had such fine portraits and such a well-rounded collection of different art styles. I liked the Cezanne the best -- even though it's not the most realistic one, it captures the personality of his wife, I think. I hope that you will be able to see some of these fabulous portraits at our Fine Arts Museum in Houston someday if that is of interest to you. There is much to enjoy there. Sending good wishes your way especially for Thanksgiving tomorrow. Thanks for letting me know which of these portraits you liked best. The one you chose is certainly detailed. That curly wig is amazing and the soft texture of his clothing is painted with such a deft hand. All the portraits are superb. But i really liked the one made by Nicolas de Largilliere. I agree that knowing a bit about the subject matter and/or the artists makes viewing paintings even more interesting. Lovely paintings and nice to know the history of the subject and the painter. Being able to paint a portrait and actually capture a likeness does indeed take talent. I can guess from what you wrote which artist and painting that you voted for in the poll. Sending good thoughts and prayers your way for you and your entire family. Yes, it is always better if you have someone in the group who knows what you are looking at. 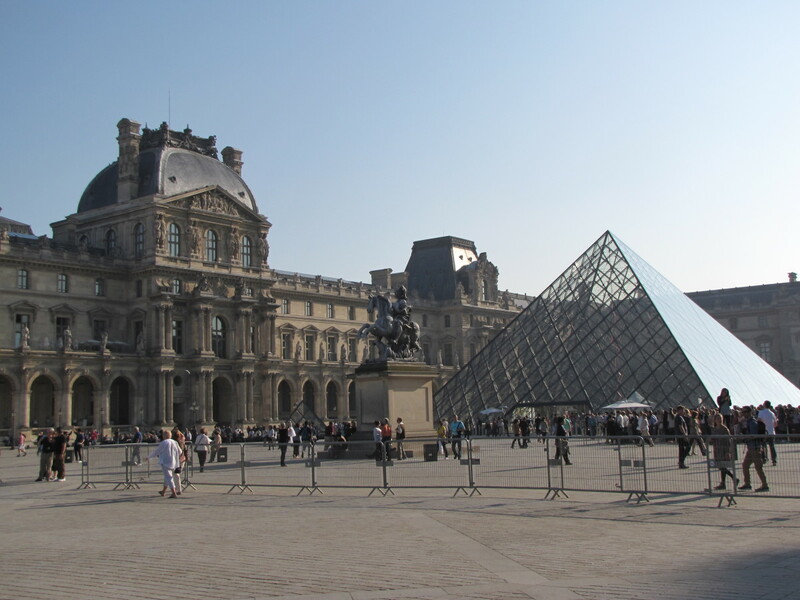 Tour guides in museums can offer great background information. My aunt was a docent at the Milwaukee Art Museum and when she visited us in Houston she was a fount of information when we visited art museums together. I had my own personal guide with her and that was fun. It's good to have a tour guide in an art museum. I've found they can give some really good background information. I agree with you. Much can be learned regarding the past by viewing historic portrait paintings. Thank you for the pictures and background. There is much to be learned from historic paintings. It would be difficult to know the names of all the wonderful artists from the past plus the present. I certainly don't know all of them. If you have some extra time when you are in Houston it would be wonderful to meet you. I didn't know many of those artists, but I love to see the pictures. I went to a Monte display in Atlanta a few years ago, and fell in love with his paintings. I really like the impressionist, but overall I must admit my ignorance. Excellent article, and I may be visiting Houston in Aug., so maybe I will visit the museum if time permits. I'm pleased to be able to show you more examples of the art you would encounter if visiting our Museum of Fine Arts Houston. Thanks for your comment. Another fascinating article about the art work in Houston! I loved all the portraits, and it’s difficult to choose one. I can imagine, how much hard work goes in each piece, by the artists. You have an excellent understanding of art, and that’s why you are able to showcase the varieties of art work to others. I hope you do get to see these magnificent portrait paintings and so much more next summer if your plans gel to come here to Houston. Would enjoy meeting you in person. Contact me ahead of time and we will make some plans. Sending good thoughts and prayers your way. It is merely happenstance that 4 of the 12 portraits featured here were executed by French artists. 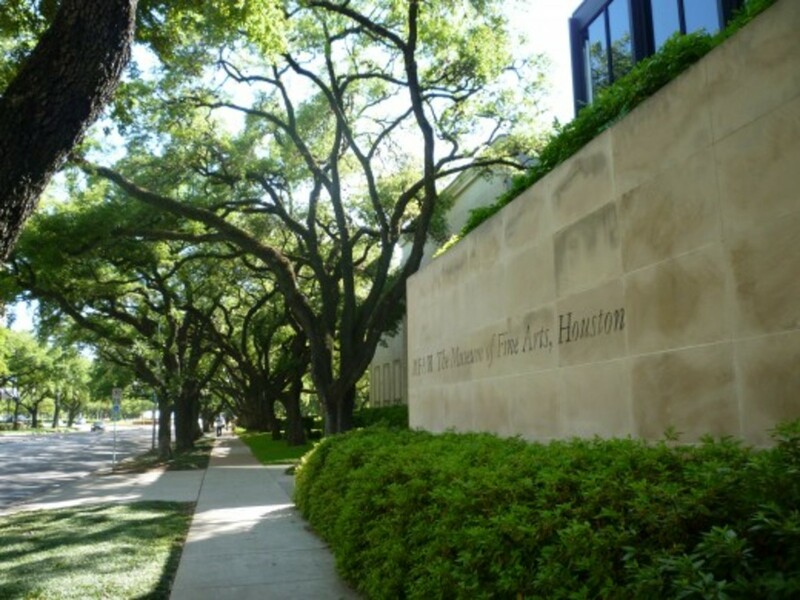 I believe that our Houston Fine Arts Museum has good representation from artists worldwide. So nice to know that you are enjoying getting to view some of what is contained in our museum buildings here in our city. Like me, you must like Princess Eugenie, as you describe her so well! She was indeed beautiful! You are doing a great service for Houston by bringing the paintings to life for us internationals or foreigners. Awesome! That self portrait by Francois de Troy is very interesting. It looks like he is looking straight ahead at perhaps an empty canvas contemplating what next he will be painting. Or perhaps he is looking at a model. Thanks for the visit. I am pleased that you liked the selection of portrait paintings that I chose to show in this post. Thanks for your comment. That 12 year old boy that you described who was painting beautiful portraits sounds like a genius. Some people are simply born with amazing talents. I had trouble deciding on my favourite painting but eventually chose the last one. I find the face of the artist very interesting. Thank you for an enjoyable and informative tour, Peggy. This is a great collection with a very good commentary alongside it. It is my pleasure to be able to show you a tiny bit of what you would find if you ever visit our Museum of Fine Arts Houston. It is also nice to be able to introduce you to artists of which you were unfamiliar. Thanks for commenting. Thanks for the compliment. The person you truly would have loved going through art museums with would have been my aunt when she was alive. She was a docent at the Milwaukee Art Center and had one of her degrees in art. She knew so much and made it so enjoyable when viewing different pieces of art because she could fill in so much of the background of what the artist was trying to portray and/or the history behind it. I am so happy to be able to be in a position to show you some of what our fine art museum showcases. This is a mere peek into what is contained in those wonderful walls. They are now expanding and soon there will be another building on the campus. Glad you are enjoying this. Mrs. Jeff Powis and Her Daughter is a beautiful painting. The drapes and folds of the clothing is painted so beautifully. As to the magnificent trees outside of the Houston Museum of Fine Arts...there are many such trees in that entire area of town. Thanks for being the first to comment. Fine art is beyond me. I can't even draw stick figures. There was a boy on Little Big Shots last night, twelve years old, been painting for ten months, and his portraits were stunning...that kind of talent is breathtaking. After reading all your hubs on art in Houston and other parts of Texas, I want to go back there and enjoy seeing all these pieces. In this one, I feel I have peeked at the best in the Musuem of Fine Arts in Houston and I'm really happy. I haven't seen works of some of these artists before. 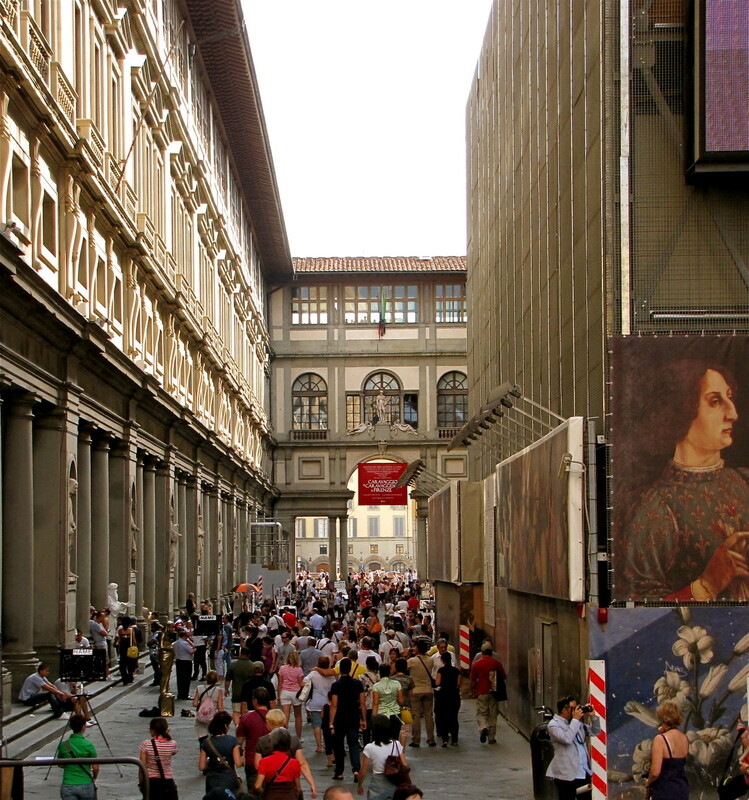 You would be a fantastic guide (formal or informal) to walk through an art museum with. Your insights and knowledge of art is so amazing. I liked so many of these but ended up voting for Princess Eugénie. 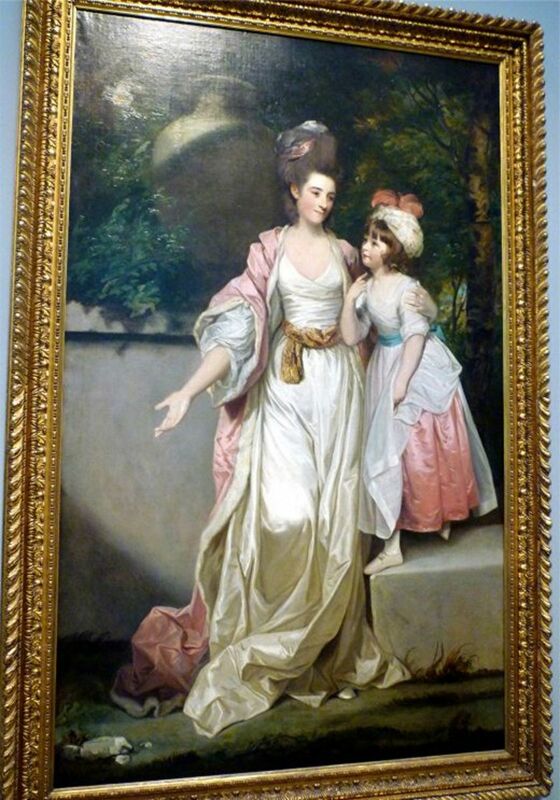 Many were good but I liked the painting of Mrs. Jeff Powis and her daughter, best. I also loved the photo you took of the tree outside the museum. I love big trees with character and I bet that tree would have some stories if it could talk!